This book is a functional guide to directors and teachers. The exercises in this book are suitable for groups of all ages, from early childhood to aged persons. Exercises can be carried out as described in the book or you can apply them according to the size of the group, the purpose of the exercise or according to time you have reserved for the exercise. Exercises in the book are easy to carry out everywhere and anytime. Substance and functionality are often mentioned in curriculums. They help directors and teachers as well as participants. All sense channels and learning styles are used. Our own experiences and activity are meaningful and important, and they help in memorizing things. Friskiness brings us energy and fun. Directors and teachers get versatile observations of the participants and their skills, which makes it easier to plan teaching and interaction exercises. Every exercise has an aim: Interaction, respect, consideration, listening, discussing, empathizing, imagination, performing, co-operation. Functionality increases the spirit and fellowship which are essential in learning results, working, satisfaction and involvement. Relaxed and confidential atmosphere in groups, exercises, performances and discussions enable dealing with more difficult things such as bullying or discrimination. 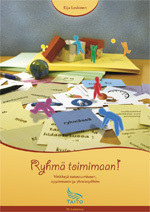 The book presents a set of functional exercises which improve self-esteem and self-knowledge.